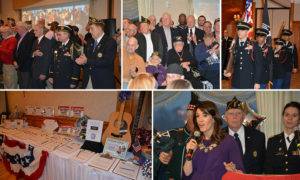 The Run For The Troops Annual Dinner Auction will take place Friday, April 20th at the Andover Country Club. This amazing event honors our veterans and celebrates the sacrifices they made for our freedom. Over 100 veterans will be our guests that evening and our beneficiaries and sponsors will also be in attendance. Emily Riemer from WCVB Newscenter 5 is our emcee. The evening includes a large dinner buffet and a silent auction with something for everyone. Some of the items this year include Three Sets of Red Sox Tickets, a Zac Brown autographed guitar and tickets to his upcoming concert at Fenway Park, Kenny Chesney concert tickets, many restaurant gift certificates, and so much more! The dinner sells out every year so please get your tickets today. You can purchase individual tickets for $50, tables of 10 for $500 or sponsor a table for veterans for $500. Any questions, please email andoverrftt5k@gmail.com.